Villereal, our local town (2 km) dates from the 13th century but now has all facilities! We have two holiday rental properties - a traditional Perigordian farmhouse and an ancient cottage. We also live on site, in a renovated barn across the courtyard from the holiday-rental properties. The properties are set around a gravelled courtyard. The large swimming pool (shared between the two gites and occasional use by ourselves) is a particular highlight and the gardens around the property are also popular with visitors - take a look at our gite gardens page for a few photos. The properties each enjoy their own private garden / terrace / outside eating areas, and large open areas (the property has 16 acres altogether). 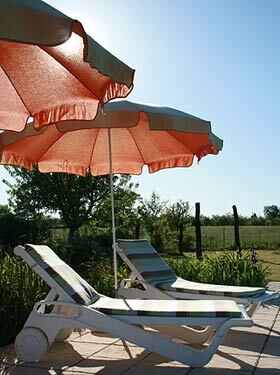 the gites are set on a small hill near the town of Villereal, on a quiet road surrounded by beautiful countryside. Our holiday-rental gites are found just 25 kilometres south-east of Bergerac, and 2 kilometres from the lively town of Villereal, in south-west France. The Dordogne region lies just to the north of the property and the less-discovered (but very attractive) Lot et Garonne region to the south. The highlights of both of these areas of south-west France are easily accessed from our property. Bergerac (and Bergerac airport with cheap flights from Ryanair and flyBe) is only 25 kilometres away. The close proximity of the medieval town of Villereal, which has all facilities and is only 2km from our holiday homes, is a major attraction for our visitors. While still remaining a completely peaceful location there is no need to drive for ages for a bottle of wine or a loaf of bread! Villereal is also a 'hub' at the centre of many of the local beautiful towns and villages, with the medieval towns of Issigeac, Monpazier, Monflanquin and Castillones all being very quick and easy to reach, along with the numerous small villages that dot the area. At least five villages within half an hour drive are included on the prestigious 'one of the most beautiful villages in France' list. Within an hour drive from here there is a bewildering choice of things to explore - the attractions of the Dordogne region are well known - the river, the chateaux, the scenery, the ancient towns and villages, the prehistoric caves and castles, and so on. All these are easily accessible from Villereal, although we avoid the congestion that can strike 'Dordogne central' during the summer months. The Lot-et-Garonne area to the south is less well known. It is often described as 'French Tuscany' and has miles of unspoilt countryside interspersed with small bastide (13th century) towns, and is less 'touristy' (quieter roads) and less developed than the Dordogne - an area to discover and enjoy. See Villereal and surrounding region for places to visit, both within a few kilometres of Villereal and our gites, and those that are slightly further afield. If you are looking for a Dordogne or Bergerac holiday, for properties where you can simply relax in quiet surroundings or get out and about exploring we are sure you will find our gites ideal. 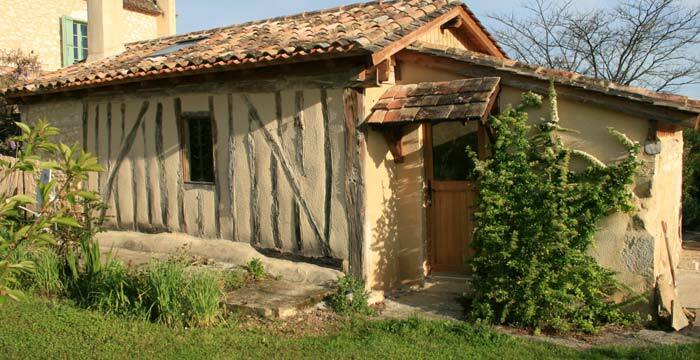 Travel to Bergerac and our holiday home / cottage is very simple and quick via Bergerac airport - the property is just 30 minutes car drive from Bergerac airport (and 2 hours drive from Bordeaux or Toulouse airports). Of course, many of our visitors prefer to drive from the UK - we are about 9 hours drive from the channel ports. We suggest you see France car hire to make low cost car rental arrangements and the travel section at travel to France when arranging your visit to the region. We enjoy cycling in the region so I have added some notes about cycling the Dordogne. I have transferred details of our original property renovation project to france renovation.